Single storey detached lodge with uninterrupted loch views and large decked area. Refurbished for 2014. A lovely few days away. Enjoyed a relaxing week in a very comfortable lodge with amazing views, didn’t need TV in the daylight, just sit and watch the fantastic scenery. Unfortunately it rained most of the time but it didn’t stop us getting out and about. Was warm and cosy in the lodge and there was plenty of info re things to do. Owners helpful and the grounds so vast, well kept with plenty to explore! Need to go back and explore some more! Would definitely recommend. Great break - will be back! Perfect location and great accommodation - lovely welcome on arrival too! This is our second visit here and we're already planning our return............can highly recommend. Wonderfully relaxing holiday with stunning views over the loch that just made us not want to go home. Jim and Julie very helpful as always. Excellent base for walks and cycles in the area. We verbleven een week in de badger sett lodge, die we erg leuk ingericht vonden en van alle gemakken was voorzien. De locatie is prima, direct aan de weg tussen Fort William en Oban maar daar hadden we geen last van. De Creagan Inn op loopafstand is ook een pluspunt! Clean, warm, convenient and very well equipped. Beautiful location to boot. Just a lovely, lovely lodge. Definitely will book again, and we’ll definitely stay for longer next time. Lovely view, welcoming owners, beautiful setting. Just great for a wonderful few days or a week. This was our second stay - need I say more! We had a great stay, in spite of the blizzard conditions in February. The accommodation was warm, inviting and clean. Our hosts were relaxed, helpful and friendly. We came to stay for a family reunion. 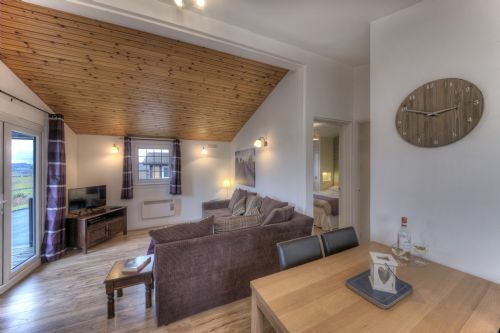 Badger sett lodge is very comfortable, clean and well designed. Close to lots of things to do. The view across the loch as the morning dawns is amazing. Hoping to come back in the summer! Just back from our fourth holiday in Appin. Cosy lodge, amazing views and lovely owners. We will definitely be back. Fab location for Oban and Fort William areas which we wanted to visit in particular. Accomodation was great with everything we needed. We were in Badger Logde for 1 week in July. The lodge was clean and we had anything what we needed inside. It was for our planing tours excellent, that we had free wifi inside the lodge (when we booked it, there was only free wifi in the playing room for all guests). The view from the lodge was great. We could see seals and boats on the water. The street nearly the lodge wasn´t not too noisy. Second year in a row that we come here. As splendid as last year. Great lodge with all comfort. Clean and nice interior. Gorgeous views over the loch. Great place to eat down the road (Creagan Inn). When we come back to Scotland, we will definitely come back here! after a few years holidaying at Appin holiday homes...sometimes 3 times a year we never tire of being there. Everything is very relaxing and comfy and we always sleep well. Every holiday there is too short . Ideal for walking and cycling. We enjoyed our stay very much the view was beautiful and the accommodation could not be faulted .Plenty of things to do and boat trips around. We love Appin so much (despite occasional glitches in the weather!) that we keep returning year after year, always staying at Appin Holiday Homes. We wouldn't do so unless we were sure of a warm welcome and good accommodation, and we haven't been let down yet! The accommodation was excellent very clean and everything you needed was there, the location was brilliant. You over look the Loch and the view is stunning. There's a pub 10 minutes walk away the food was absolutely gorgeous. Enjoyed our holiday so much will definitely return again. Thoroughly enjoyed our stay at Appin Holiday Homes. Ideal location for anyone looking for the Chequered Skipper butterfly with its close location to Glasdrum Wood NNR, we also found them along the old railway line at the back of the lodges, We stayed in the Badger Sett Lodge which was clean and suited all our needs. Reasonable quality lodge, with modern style fixtures and fittings. Some nice touches (built in USB charger points for mobile devices). Warm and comfortable. Could maybe do with some simple maintenance, but overall not bad. Hosts very attentive, and prompty dealt with minor issues. Lovely setting, and grounds well maintained. The "Games Room" however was cold, unwelcoming and slightly musty, which was only a minor complaint. It's there you get your wi-fi fix if you need it. We used the ample DVD collection, which kept us entertained during the rather inclement Scottish spring weather. Thank you for the lovely review we are so glad you enjoyed your stay and the weather was fab - still is - fingers crossed. Had great time (as usual) in superb location overlooking loch. Just love the peaceful area and chalet. - what more could you ask for? Without a doubt, we will be going back. Looking forward to it! site was superb. The pub down the road was the icing on the cake! Peaceful beautiful location, with surrounding mountains stunning in autumn sunshine all week. perfect views of the loch, and is very comfortably furnished. Well maintained site. cabins well maintained with all you need ,location is great for Oban with lots of other places to visit with plenty of information. We have wanted to return to Appin Holiday Homes since our first visit 23 years ago but it has not been possible until this year, and we were not disappointed at all, it was everything we remembered and more. The lodge was comfortable, clean and had all mod cons you would expect and was tastefully decorated. The balcony area was where, when we were in, the place we spent the most time, admiring the fantastic views over the Loch and watching the seals bobbing up and down, the Finch's in the day and bats at dusk and the comings and goings of the boats. The owner, Jim, was very amenable and although we had no problem, it was obvious that he would be happy to deal with any issues that may arise. There are some lovely areas locally to explore and a lovely pub/restaurant a 5 minute walk away (which needs booking if visiting at busy times). Great value for money, highly recommended - we are already planning our return visit for next year (would be next week if we could!!!!). Stunning spot for a family break. We spent 6 days at Appin Lodge in July. The location is stunning, peaceful & quiet, overlooking beautiful Loch Creran. The lodge was fine, a little tired, small & needing a new shower, comfy sofas & new toilet seat! No amenities provided so take all your own towels, etc. We had a very relaxed break & used the lodge as a base to explore the amazing local countryside. Highly recommend the location & Jim was very pleasant to deal with. Overall a really good place to stay. Thoroughly enjoyed our weeks holiday at Badger Sett lodge. (Wish it had been longer) The lodge was comfortable, clean, bright and airy, and set in a delightful location with a wonderful view. Just the place to get away from it all, relax, and unwind. The owners were very friendly and were keen to make our holiday as carefree as possible. We would happily recommend Appin Holiday Homes. The equipment in kitchen and sleeping room was a bit old fashioned, the "living room" was okay. The next grocery store is more than 4 miles away, but there is a good restaurant nearby. Super place to unwind sitting on the balcony looking at the view. Scotland is can be unbeatable in the sunshine. Highly recommend for a break from it all. Our third visit to an Appin Lodge. Lodges are clean and comfy with fabulous views over the Loch. My son enjoys the outdoor chess and draughts and the tree swing. We like to cycle part of Route 78, and walk up Ben Lora for the spectacular views. We always have a lovely time there and it will definitely be somewhere we will go back to again. thanks for the excellent review it is always nice to here that returning guests still find plenty to do in the area. The Beinn Lora walk is one of our favourites. Excellent cottage, warm and comfortable and sat in the perfect place overlooking the lock! Short walk to a nice pub with good food and a short ride to Port Appin and the excellent PierHouse. We loved the view from the verandah looking out to the Hebrides, it was magnificent. Our disappointments with the stay were that there were no towels provided, including no tea towel. As we were travellers from overseas we had not expected this. Also we had understood there was WiFi, however this was only available in the games room which was rather cold and musty. As we needed to access WiFi this was also an issue for us. Apart from these the above we very much enjoyed our stay and would recommend it to other travellers. Everything was perfect, clean, cosy, perfectly located.......but..... We are self catering holiday makers. Badgers Sett does not provide the means to self cater properly. Has a lovely microwave but no way to use it (no lidded casserole dish), no SHARP knives, we had to go out to buy some, no chopping board ( hence the knife marks we found on the lovely work tops), and no oven gloves. On a health and safety note, had we not been looking for a tray, we would not have found the fire blanket! These negatives are the only reason that we will not visit this site again and the reason I cannot recommend it to others. Appin holiday homes review, great location . Overall pretty good especially location just couple problems , freezer door broken , loo roll holder broken. Compact but as big as you need on holiday. Slight smell of damp in bedrooms but that seems to be the norm on west coast. Beds comfy, slept well. Great location for relaxing walking or cycling. Jim and Julie extremely helpful. Lots to see and do. We enjoy staying here so much we are sad to leave but look forward to coming back. Peaceful weeks (4 nights M-F) holiday in cosy wee lodge. Arrived about 5ish on a pouring wet and cold Monday night and was greeted by the owner who informed us the radiators were on in the lodge! Fantastic - warm and toasty! Pretty much left to our own devices for the rest of the stay (we are intelligent adults after all). Pottered about in Oban. Great for cycling and eating, and visiting the odd attraction. Thank you for your kind review we are glad you enjoyed your stay despite the weather! - we rang en-route to say we'd be a bit later than anticipated and were given arrival instructions. Not long after arrival Jim came and said hello and checked we were settled in ok.
- The lodge is surprisingly spacious, modern and well laid out. - There is plenty of room and storage in the bedrooms with a dressing table in each room as well as built in wardrobes with plenty of hangers and space to put your cases. - The whole lodge was surprisingly warm given the weather outside and the heater only had to be on low for a while in the evenings to take the edge off. - the well provisioned games room was a hit with our daughter and it was great to be able to sit in there and use the Wifi while she played. - there is a nice big double shower which was perfect for us and the lit bathroom mirror was also excellent. - The main bed was a bit small (but then that's the compromise in the space available) and the mattress too springy for our tastes but bearable. Thank you for your lovely review on your stay. We are sorry you did not like your standard double bed which had a new memory foam mattress installed in October 2014. We will look into adding a shelf in the bathroom and some more hooks. Glad your daughter enjoyed the Games Room. Hope you had a safe flight home. Could have done with a throw for the bed it was chilly at night. Pillows and quilts need replacing cushions as well. Enjoyed our stay very relaxing. The Creagan Inn very handy and very good food served. The chalet was fine- the view from the veranda across Loch Creran is superb, and the immediate surroundings are really pleasant. The main road is close in front, but traffic noise is not obtrusive. Julie and Jim ran the site, and were really friendly and helpful. The location means we could easily get around this stunning area of Scotland- quite brilliant! A good restaurant about 500 yards away, by the edge of the loch. All in all,what a place to stay for our Golden Wedding- highly recommended! This holiday was the 3rd spent at Appin Holiday Homes which alone tells you how much we enjoy it. 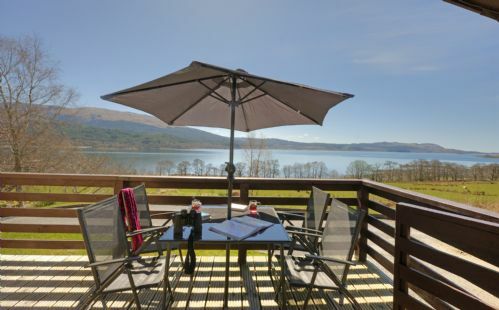 Excellant panoramic views of the loch and surrounding mountains. A very peaseful and relaxing break. Generally we were very pleased with our stay, the location is great and the staff are very helpful. My only concern are the beds which need to be replaced. That being said when my daughters bed broke, the bed was fixed promptly and without fuss, which is what you want if you have a problem on holiday. We had a great time on holiday here and would definitely come back again. Stayed at Badger Sett lodge for half term week. Lovely lodge with all you need in it. Even a torch for the dark nights. Even the weather didn't ruin our stay even though there were three landslides!. Lovely peaceful setting, amazing views and not too far of a drive to local restaurants. Oban only half an hour away. The lodge was warm and cosy and value for money. Would love to return in the Spring or Summer as many places were closing for the winter. Only a couple of things that the lodge needed and that was a bath mat for the shower cubicle and a higher chair in the bedroom for the dressing table. Lovely large decking. Shame we didn't have the weather to sit out. Would definitely return. Myself and partner, plus two young children had a great time at Appin holiday homes. The lodge was perfect, luxurious without being modern and soulless, comfy without being small, and with a view that takes some beating. Brilliant surroundings, very peaceful, looking over Loch Creran. Perfect place for exploring the countryside with various walks of different degrees of difficulty all no more than a few minutes drive away. There are plenty of things for the kids to get up to; the gamesroom full of toys, loads of wee secret paths to explore, and a big loch to chuck stones in! Would recommend to anyone of any age looking for some peace and quiet (not that we had much of that with the kids). Can't wait till next time-we're already looking ahead to next Easter and planning for another week there. Happy days!! Arrived on Monday afternoon in overcast weather and got straight into the lodge. The bed was a good comfy double bed, already made. Excellent nights sleep. The views from the veranda was amazing, excellent. Felt sorry to leave after only four nights, we will certainly go back. Enjoyed the area and the owner was very helpful and friendly. Great view from the cabin over the loch. Laundry room needs an overhaul and a good clean.